Before he achieved international notoriety as a singer, actor, and political activist, Paul Robeson was a pro football player. An All-American end at Rutgers (named twice by Frank Menke in 1917 and ’18 and by Walter Camp in 1918), Robeson played two years in the fledgling NFL while earning his law degree at Columbia University. One of a very few African-Americans in the league, he had good size for the time at 6’3” and 219 pounds, and was considered to be outstanding both on offense and defense. On November 19, 1922 he was the key player in a game between the Milwaukee Badgers and Oorang Indians. Robeson had joined the Badgers, who were new to the NFL (as the former American Professional Football Association had just been renamed). Much was expected of the club that also signed Fritz Pollard, another pioneering African-American player who was a star back and coach with Akron. Alvin “Bo” McMillin, All-American tailback out of Centre College, was just joining the team that had a disappointing 1-1-3 record and played to scoreless ties in its last two contests. The Oorang Indians were an oddity, even in the somewhat freewheeling world of the early NFL. The roster was composed entirely of Native Americans and the legendary Jim Thorpe served as player/coach. The team’s name came from the Oorang Dog Kennels in little LaRue, Ohio, the business of team owner Walter Lingo. The franchise operated as a traveling team and, while it boasted colorfully-named players and rather elaborate halftime shows that utilized the kennel’s dogs, it also had a woeful 1-5 record. There were 6500 fans in attendance for the Sunday game at Athletic Park in Milwaukee. Much of the contest’s attraction was the matchup of the two star backs, Thorpe and McMillin. The first score came early in the game, after an initial exchange of punts. The Indians had possession at their own 12 when HB Eagle Feather fumbled and, following a mad scramble for the loose ball, Robeson scooped it up near the goal line and rolled into the end zone for a touchdown. Charlie Copley’s extra point attempt failed, but the Badgers held a 6-0 lead. Oorang didn’t threaten to score during the first half until the offense came alive late in the second quarter and the Indians drove to the Milwaukee eight before time expired. The teams again traded punts to start the second half. Starting at their own 25, the Badgers kept the ball on the ground to reach midfield before back Mike Purdy threw to wingback Al Greene, playing his first game with the Badgers, for 12 yards. After a two-yard carry by McMillin, the second Milwaukee TD came on a pass by Purdy to Robeson. The big end caught the ball in the midst of several Oorang defenders and ran 20 yards for a TD. Along the way, Greene made a great block on Eagle Feather at the 10 to remove the final hurdle to Robeson’s scoring jaunt. Copley was successful this time in adding the extra point. That was it for the scoring, although McMillin made an exciting play in the fourth quarter when, in punt formation, he ran to his left, cut back across the field, and retreated back some 20 yards while dodging tacklers before throwing to Robeson for a gain of five yards. Milwaukee won by a final score of 13-0. Bo McMillin had a good debut for the Badgers, directing the offense effectively both on the ground and through the air. Paul Robeson was the game’s top lineman as well as scorer of the only touchdowns and Fritz Pollard ran effectively. Jim Thorpe played the entire game for the Indians. At age 35, he was past his prime but still an effective player. He had several long runs on offense and especially distinguished himself on defense, where he was in on many of the tackles. The Badgers didn’t win again – and in fact scored only six more points – in finishing at 2-4-3 and eleventh in the 18-team NFL. The Indians, on the other hand, won their last two contests to end up at 3-6 and right behind Milwaukee in the standings. 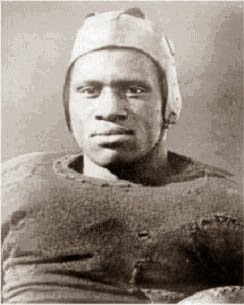 Paul Robeson’s 1922 season was his last as a pro football player. He graduated law school, although he didn’t stay in the legal field for long and rapidly moved into the world of music and the theater. But he made a brief imprint as an early pro football player, especially with his outstanding performance against Oorang.